Gap years only for the young? Not anymore! After backpacking around the world, one question lingered though, according to Herrmann. "Why is it when we grey up top, we let our young generation have all the fun? They are out there in their thousands. Confident travellers. Enjoying the adventure of experiencing and learning about the world we live in. We're seriously missing out." he said. Herrmann documented the stories of his journey in a weekly blog. His followers were so inspired, they convinced him to put his story into a book. He's now out speaking to groups, telling the story, seeking to inspire other people. The story is not just about travel. It's also about all those fears we have. The ones that stop us from simply stepping out the door. "There were a hundred reasons why not to do this gap year" he recalls. To give up his home, sell the furniture, sell the car. To take off for twelve months backpacking around the other side of the world. "What, giving all this up? Surely, you’re too old. And what, travelling solo?" were the messages that confronted him. But thankfully his gut feeling won over. "Had I succumbed to my Mr Logic I'm here to protect you to keep you safe and comfortable voice inside the head", as he explains it, "I would have missed out on one of life's highlights. The experience of getting out there, stepping outside the comfort zone and enjoying the fascinating world we live in", he said. His journey has been recently published in a book, My Senior Gap Year. Though it was never his intention to write a book, the book tells his story in his own unique style, from not knowing a word of Spanish to his amusing attempts to communicate with the people he encountered. Backpacking from one country to another. Experiencing every form of transport from a horse and cart to a five-star coach. From sleeping on the floor of a Buddhist temple to a mat in the middle of a jungle. But as much it's an invitation to experience the liberating feeling of escaping from the normal routines of life. To feel the sense of being free to just go as you please. To discover and learn about new and exciting places. Interesting people. Fascinating cultures. Issue that confront and challenge us. And to share the many humorous instances that happen along the way. How his experiences with the people he met, like drugs, waste, terrorism have changed his views. He left with no purpose, other than to step out the door, travel and explore. But then how he turned an opportunity he discovered in the middle of the desert to benefiting charities in Australia and around the world, worth over $250,000. And that was just at the beginning of his journey. "My Senior Gap Year. It’s never too late." The Federal Government Minister for Aged Care, Ken Wyatt, will officially launch the My Senior Gap Year Book in Perth, Tuesday 20 March, 2018. Ken Wyatt Media Release: Wyatt: We should consider a “Seniors Gap Year"
The young generation have been taking a gap year for decades. But there's no such thing as too late. That’s what Chris Herrmann thought when he decided to take a senior gap year. 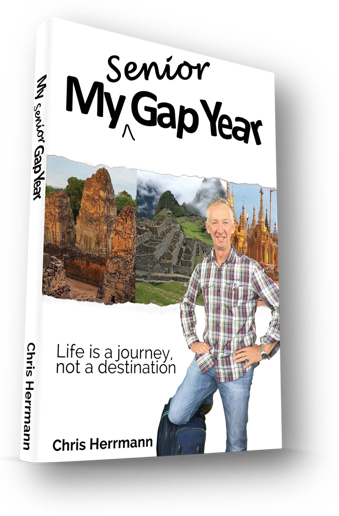 His new book, My Senior Gap Year, tells the story of a not so typical young backpacker on a senior gap year. Chris Herrmann's career has covered both corporate management and the founder of a small business technology start up. Innovation has always been at the forefront of his activities. His business has been recognised for several Australian Government Small Business, Entrepreneurial and Innovation Awards. His client list has included some of Australia’s top listed companies. He has served as an adviser to Saudi Arabia's Telecommunications management as well as management roles in the telecommunications industry. He has presented at a Chinese University in Kunming on commercialising technology. Chris has served as a member of a State Government Business Development Council advising the Minister for Small Business. He has been an active participant in community fundraising event projects raising funds for Surf Lifesaving and Rotary International. Nearing the age when most start thinking about retiring, Chris took a different direction. With no desire to retire, he took a gap year. A Senior Gap Year. Intentionally, he set off to do the exact opposite to his professional past. No structure. No goals. To be free and just explore. Equipped with a new title, a Senior Gap Year Specialist, his next vision is to encourage more people of his age to do similar! Chris Herrmann's career has covered both corporate management and the founder of a small business technology start up. His business has been recognised for several Australian Government Small Business, Entrepreneurial and Innovation Awards. His client list has included some of Australia’s top listed companies. He has served as an adviser to Saudi Arabia's Telecommunications management as well as management roles in the telecommunications industry in Australia nd North America. He has presented at a Chinese University in Kunming on commercialising technology. Chris has served as a member of a State Government Business Development Council advising the Minister for Small Business. He has been an active participant in community fundraising event projects raising funds for Surf Lifesaving and Rotary International.